Find out how to accurately measure common jewelry sizes with these easy to follow charts. Remember that this is a close approximation. Screen resolution and monitor size will affect how you view the chart. Remember to allow for the length of your clasp. If you use spacer beads or mix sizes, this chart may not be accurate. Seed beads are sized in aughts, which are different than millimeters. The most popular school of thought of the sizing of seed beads states that the size (6/0) refers to the number of seed beads per inch (7 beads per inch). Another sizing theory is that the size is based on the rod used to make the beads. The larger the number, the smaller the bead (20 is small, 3 is large). Remember that this is a close approximation. Screen resolution and monitor size will affect how you view our charts. 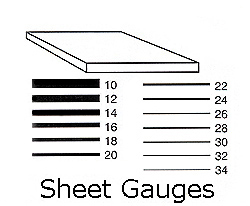 Wire Gauges - In reference to wire gauge sizes, the larger the number, the smaller the diameter of the wire. The most commonly used sizes for wire wrapping are 20 to 24g. Wire Temper - Measures the amount of spring in the wire. Soft - Has no spring when you bend it. Good for making wire beads. Half-Hard - Has some spring, but is still malleable. Good for basic wirework. Hold its shape well. When affixing Hot Fix crystals to fabric it is important to use enough heat to activate the adhesive, but avoid using too much heat that will in turn, damage the crystal. Use the table below to estimate how much heat you will need to affix Hot Fix crystals to the desired fabric. We recommend using a Teflon sheet to protect the crystal and fabric, and using medium pressure on an iron to ensure that you do not damage the materials. Please note that the temperature/time combinations shown in the above table are guidelines only. Always carry out tests before starting on the actual piece in order to find the best settings for your design. Here are some basic guidelines to follow when caring for fabric with Xilion Rose Hotfix. Before Washing - Turn the garment inside out. Be sure to use a gentle wash cycle and a mild washing powder or liquid. To make sure that the crystals are not harmed during the wash, protect them with a soft, washing bag. Before Drying - Turn the garment inside out. Use a low temperature and a gentle drying cycle. To make sure that the crystals are not harmed during the drying cycle, protect them with a soft washing bag. When Pressing - Set the warmed iron to "Wool/Silk/Polyester/Viscose" Protect the clothing with a piece of cloth as a buffer between the fabric and the iron. Be careful when ironing, because if the iron is on for too long it can reheat the glue on the Hotfix crystals. Dry Cleaning - garments with Hotfix crystals can be dry-cleaned.